The curbs that separate pedestrian walkways from vehicular roadways provide critical safety and directional information to individuals with blindness. Curbs are a useful orientation cue, as they are detectable by people using a long cane. People impacted by blindness may experience problems with the curb ramps and depressed curbs that are used to provide step-free access for people who use mobility aids (e.g., walkers and wheelchairs) at pedestrian crossings and vehicular loading areas. Unless appropriate safety features are incorporated into curb ramps and depressed curbs, individuals with blindness may not be able to tell when they are moving from the safety of a pedestrian sidewalk onto a vehicular roadway. A curb ramp at a vehicular loading zone. Curb ramps provide a sloped access route from a pedestrian walkway down to a vehicular roadway. They are typically at least 1,500 mm wide and used most frequently at pedestrian crossings and intersections. Depressed curbs also provide a sloped access route from a pedestrian walkway down to a vehicular roadway, but they are much wider than a curb ramp, typically running the entire length of an element such as a vehicular drop-off area. A depressed curb at a vehicular loading zone. It’s important to make sure that curb ramps and depressed curbs are properly identified, giving a person with blindness sufficient warning that the walkway is about to end and the road is about to begin. People impacted by blindness use the grade separation between a sidewalk and roadway as the primary distinguishing factor between the safety of the pedestrian and danger of the vehicular areas. The attention TWSI is the backup feature, particularly as the TWSIs can be obscured by snow, ice and debris. The slope of curb ramps should be between 1:15 and 1:10. Shallower slopes would make the transition from sidewalk to curb ramp difficult to detect for people impacted by blindness. Steeper slopes would make the curb ramp difficult to use for people who use mobility aids such as wheelchairs or walkers. Consider the use of different ground finish materials to differentiate the curb ramp from the sidewalk. Where flared sides are integrated into a curb ramp or depressed curb, if they are too steep they will be a tripping hazard. The slope of flared sides should be 1:10 in the direction parallel to the curb. The slope of depressed curbs in any direction should be no steeper than 1:50, but never steeper than 1:20. An attention TWSI should be used to alert people impacted by blindness to the presence of a curb ramp or depressed curb of any kind (e.g., at intersections and pedestrian crosswalks). 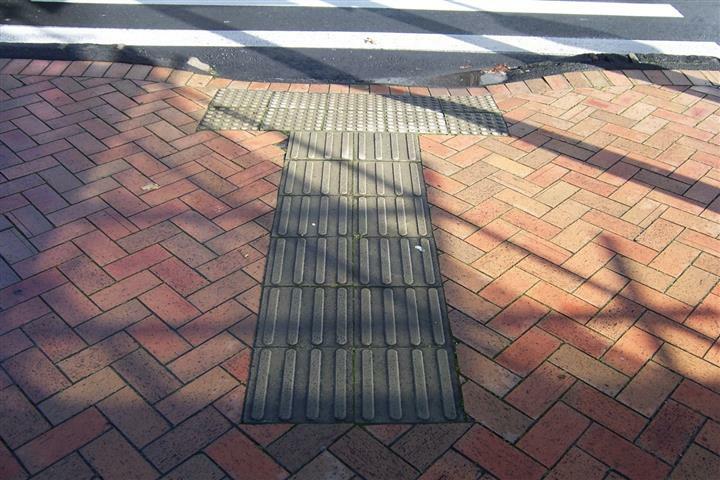 Further information is provided in the sections Tactile Walking Surface Indicators and Colour and Brightness Contrast. When a TWSI is used, it’s permissible to have no lip at the end of the curb, providing a completely blended curb-to-road transition for the benefit of people using wheelchairs. 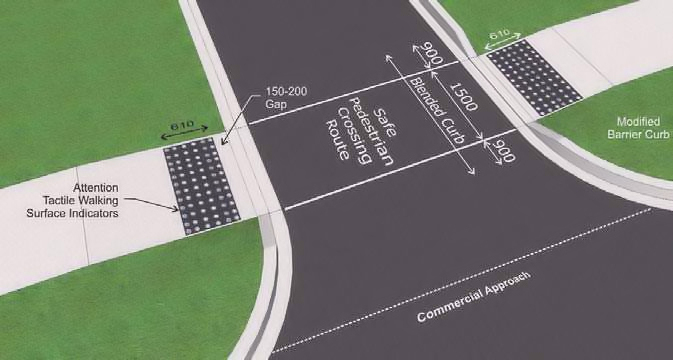 Attention TWSIs should be set across the entire width of the curb ramp or depressed curb edge (exclusive of flares). They should be set back 150 – 200 mm from the curb’s edge and extend for a depth of 600 – 650 mm in the direction of travel. Further information can be found in the section on TWSIs. Give consideration to curb ramps or depressed curbs located at the side of a path of travel. People impacted by blindness may not detect their presence if they are using the opposite side of the path as an orientation boundary. In such locations, use a 600 – 650 mm guidance TWSI across the path at the curb ramp or depressed curb. It’s critical that curb ramps direct pedestrians onto a safe pedestrian crossing route across the roadway. The curb ramps on either side of a crossing should be aligned and the crossing route must be perpendicular to both curb ramps. A good example of curb ramps used at a four-way intersection. The pedestrian crossing route on the roadway should be clearly identified for both pedestrians and drivers using markings or materials that contrast in colour and brightness to the road’s surface. If paint is used it should be slip resistant. With a four-way intersection, there should be eight curb ramps: two for each corner, and each independent of the other. This ensures a straight route of travel for all crossing paths. When curb ramps are used at mid-block crossings, their presence should be identified using guidance TWSIs across the width of the sidewalk. A good example of curb ramps that are aligned on the same axis. A good example of curb ramps at a mid-block crossing. Note that directional TWSIs are required to assist people impacted by blindness identify the presence of the curb ramp. Depressed curbs can be difficult to detect for individuals with partial sight, as the transition from a pedestrian sidewalk to a depressed curb may be subtle. Where these installations exist, it’s essential to provide appropriate tactile and colour-contrasted warnings to clearly delineate the boundary between pedestrian and vehicular areas. Avoid the use of wrap around depressed curbs at the corners of intersections, which can misdirect individuals into the intersection rather than to the safe pedestrian crossing route. Where these installations do exist, pedestrians with sight loss must be able to clearly identify the safe crossing route, and barriers must be installed to prevent vehicles from coming up onto the sidewalk. The use of bollards or other features that are colour/brightness contrasted to the surrounding environment are recommended at depressed curbs to prevent vehicles from entering pedestrian areas.